It’s no secret that Sperry Charleston Race Week (April 14-17, 2016 in Charleston, SC) has become a spring sensation. This multi-class regatta – the largest keelboat gathering in the Americas – is mecca for trailerable sportboats. In 2015, nearly 300 boats materialized for three days of tight competition across 16 different classes. The majority of those boats – with crews from 29 states and 11 foreign countries – were one-designs, including 79 J/70s. For 2016, the organizers anticipate a similarly strong turnout from the one-design crowd, with significant growth among offshore models. In 2015, the J/88 class drew just four entries, but as of mid-December, there were already four of those boats entered, with the promise of others to follow. And the outlook for the Farr 280, J/111 and C&C 30 classes appears similar. On shore, the most noticeable change will be in the event venue itself. The Charleston Harbor Resort & Marina is opening an entire new facility, The Beach Club, which will doubles the on-site accommodations for competitors. This new luxury wing has two pools, a patio bar overlooking the marina, and a bocce court. 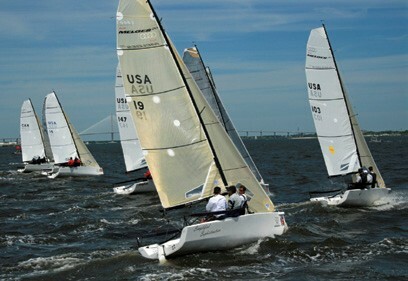 Sperry Charleston Race Week is open to boats 19 to 80 feet in length, and participants can anticipate top quality race management on the water and superb Southern hospitality on shore. For additional information, log onto charlestonraceweek.com and follow the event’s Facebook page.